And now… I am returning to who I am at my core. Transforming to a higher place of true self with vitality, integrity and strength. I grew up on the banks of the beautiful Murray River in The Riverland South Australia. My family – Dad (Peter, or affectionately known as Wal), Mum (Suzie) and younger brother (Wattsy) lived on a 50 acre bushland property. Our 1920’s sandstone family home was lovingly and meticulously restored from ruin by my Dad, and to this day Mum and Dad still live in the family home. My childhood was typical of the late-1980s and 1990s, carefree and predominantly focused on school and sport. Living 10km out of the nearest main town meant my brother and I led a very active lifestyle, outside every night after school usually playing sport or just hanging around the farm. Thanks to Mum and Dad’s support and my Mum driving me around, I was lucky when I was growing up to play lots of different sports. Often entire winter Saturday’s were spent at hockey playing multple games in under-age and senior teams and week nights during the summer were at the basketball stadium. This led to an exciting journey competing as a National Champion High jumper and eight years of competing as an elite level Track and Field Athlete. Competing at that level required a lot of personal dedication and sacrifice. Training solo twice a day while juggling senior high school and six hour round trips to the city to compete on weekends was normal for me. I am so grateful I was surrounded with fantastic family support and great coaches and mentors who all played a major role in my personal success at the time. One of my highlights was being ranked top 3 in the world for my age group when I was 16. When I was 17 I finished high school and moved to the city to focus on my high jumping and study management at University. This move required leaving the family home in the country and moving into a share house in the city of Adelaide. 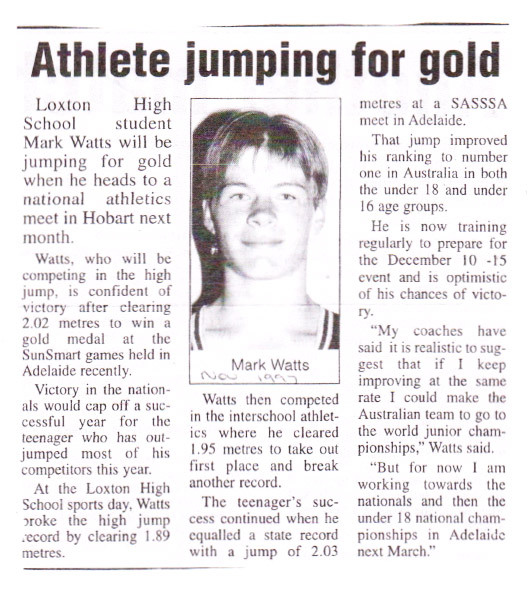 While gaining admission to University was a proud moment, the main focus was getting to Adelaide to be surrounded with constant elite athletic coaching. Towards the end of my degree I started to experience strain on my body as a result of the years of constant training and competition. Rather than reconstructive surgery on my heel I retired from athletics and joined my then girlfriend in a move to country Victoria when we finished our University degrees. … I lived in Victoria for two years and worked in one of my passions – technology. When I returned to Adelaide I spent the next ten years in two different roles within the consumer electronics industry representing some of the biggest electronics brands. It was an exciting time as so much was changing and new technology was always coming onto the market. I really enjoyed the time mastering my skills in Sales, Marketing, Relationships, Negotiation, Leadership, Training and Presenting. After retiring from elite athletics, while still very active with sport, the elite standards of living (balance, healthy eating, early nights, plenty of sleep etc.) that were a focus, dissipated. … Unfortunately I didn’t learn from the experience and once I was feeling better physically it didn’t take long for the lifestyle temptations to creep back in… And I got pneumonia again the following winter! This lifestyle continued into a marriage which had its share of emotional highs and lows, but over time it would become clear that our connection wasn’t what it once was. It took a lot of courage for one of us to make the call that enough was enough and separate. At the time it was like hitting rock bottom… As I took time to heal and reflect, I realised just how much I grew within those years. It was in those dark hours that I began to realise how far I had moved away from me and my values. I had been discontent for a long time… chasing the material things which don’t bring true happiness, only discontentment and a continual chase for “the next thing”. After picking up the pieces, hours of self reflection and having a honest and authentic relationship with myself I was blessed with a true synchronicity… I had someone from the past re-enter my life. … On top of a compassionate friendship, this person introduced me to a life coach. This was a massive turning point in my life where I was able to take some impartial suggestions and begin working through some blocks and voids in my life. … One of those blocks was my career… For years I loved working in the consumer electronics industry, but I was bored and I needed a change! … My life coach suggested I write a list of how I wanted to “feel” about work rather than what I wanted to “do”. Within weeks, with my intention floating around in the universe, I was scrolling online and the first 12 lines of an ad within a disability enterprise appeared – almost word for word to what I’d written. … I applied for the Business Development Executive role and nosed out over 200 candidates on the third time they’d advertised the role. I feel blessed that this role gave me the opportunity to work with some amazing and inspiring people. Like many that discover a good life coach, it ignited my curious self again, a search to fill the voids I’d previously filled with things that didn’t serve me, and to replace them with passion and purpose. … I switched off the TV, took a lot less visits to the pub and went back to being a nightly scholar – reading, watching documentaries, learning to meditate, breathing life – literally – back into my being and my essence. … I began nourishing my soul with activities and content that served me for my greatest good. … For more than three years I have focused my energy delving into many different meditation techniques, breathwork, holistic living, nutrition, biohacking, movement, happy authentic relationships and getting back out in nature. … I have literally spent thousands of hours researching these passions, testing many learned methods and techniques, sharing them with others and implementing what works well for me either on a permanent or cyclical basis. … I’ve taken multiple opportunities to immerse myself in the physical presence of some of the most inspiring and successful teachers and thought leaders walking this planet. I’ve invested my time and financial resources into learning from the best teachers in areas that I am passionate about. I’m grateful to have shared direct experiences with names such as Wim Hof The Iceman, Tony Robbins, Dr Joe Dispenza and Jeffrey Slayter just to name a few. … I’m fascinated by wisdom left by our ancient ancestors and connecting with universal holistic knowledge that our truth is there for us all if we take the time to look within. … Our reconnection and friendship allowed us to have a soul remembering. A remembering that we are here in this lifetime to experience it together, to share our love offering together with the world. … Our deep connection balances me and she inspires me daily. Our relationship is honest and authentic to the core and together we dance through life collecting amazing experiences. … Being present and actively involved in the birth is a choice I’ll always be grateful for and will be able to recall for all time to come. … We often hear how amazing it is from others when their children are born… When your own turn up, the feeling and overwhelming sense of unconditional love consumes you like a big warm hug. … Becoming “Daddy” and the guardian of such a beautiful little soul is a role that I’m most grateful to be able to play. My passion is bridging all of the areas of life that serve my highest good from a holistic perspective. … Love, Fulfilment, Vitality, Transformation, Health, Nutrition, Movement, Nature, Relationships, Meditation and Spirituality are all at the core of who I am. I see so many people stuck day to day, feeling trapped like there is no way out and nothing will change. My passion is to work with those people to allow more love, light and fulfilment into their life. … By drawing on my experience of working through my own voids of love and facing my fears, I hope to be able to ignite that within others and help them to see that they too can make choices that serve their highest good. … I believe everyone is worthy of love, health and happiness, we just have to choose and allow it and believe we are enough. I’m passionate about leaving behind the focus on what separates us and working to what unites us as a human family. … This starts with each of us stepping into our truth and remembering who we truly are, not what someone else wants us to be or who we think others want us to be. The answers lie within us. Learning to trust, surrender, allow and accept our own universal plan and letting it unfold is the key. We all have a beautiful inner light that guides us, some of us have momentarily forgotten how to connect with it. I love spending time with people who want to learn, grow, embrace vulnerability and allow their true self to shine. I am committed to working with people to help find that place within, make choices that serve their highest good and step into who they truly are and why they are here in this lifetime.